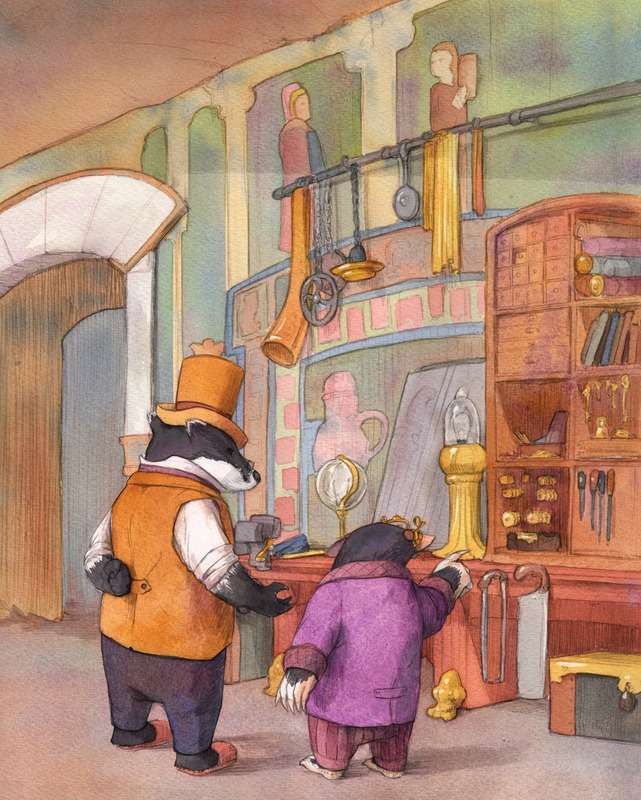 Mr. Badger and Mole are born makers. What else is there to do when you live in a hole in the ground? I took a great deal of delight in imagining and bringing to life their home workshops; each a very personal reflection of the animal who lives and builds in them, but both practical, useful and interesting spaces. "Well, very long ago, on the spot where the Wild Wood waves now, before ever it had planted itself and grown up to what it now is, there was a city—a city of people, you know. Here, where we are standing, they lived, and walked, and talked, and slept, and carried on their business. Here they stabled their horses and feasted, from here they rode out to fight or drove out to trade. They were a powerful people, and rich, and great builders. They built to last, for they thought their city would last for ever." Thus Mr. Badger describes his home, and I felt sure it must be Roman ruins that he alluded to. So, as a backdrop to Badger's extensive shelves of tools, long work benches and recycled finishings are the remnants of a Roman villa, complete with marble arches and tiled frescoes. Such grand surroundings produce grand designs, like Badger's reclining wing-back armchair, or his stately, beaten-copper furnace. Badger builds for comfort and practicality, artifacts that will be long-wearing and useful his whole life-time. Just like the ancient home he has found and repurposed, Badger builds things to last. "Rat was running here and there, opening doors, inspecting rooms and cupboards, and lighting lamps and candles and sticking them up everywhere. 'What a capital little house this is!' he called out cheerily. 'So compact! So well planned! Everything here and everything in its place!'" When Mole takes Ratty to his humble home after a long absence, he is aghast at the cramped space and lack of facilities. 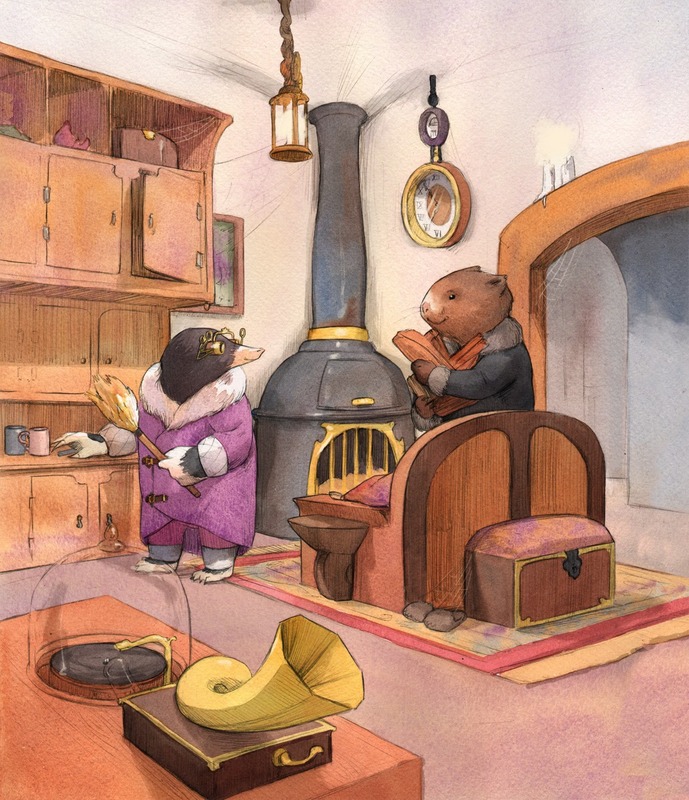 Rat, however, sees it in a more appreciative light: it is a home perfectly suited to Mole's needs, modest and comfortable, without a hint of excess or wastefulness. 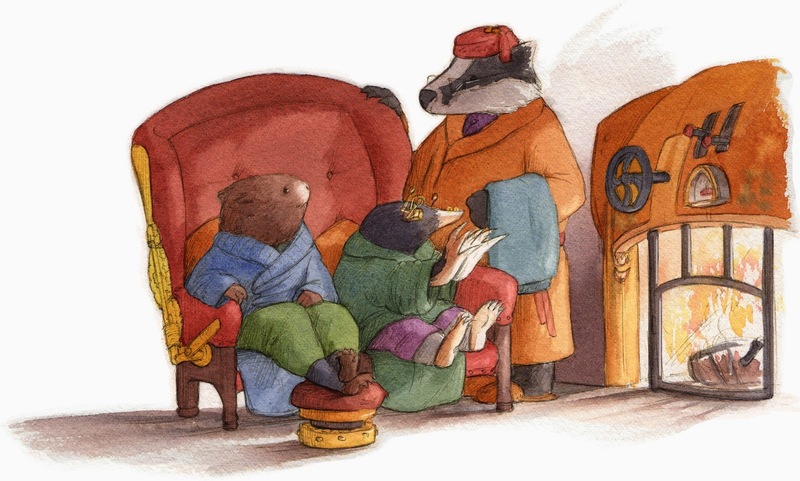 In this cosy space with his large and cumbersome paws, Mole makes things of beauty and delicate craftsmanship. The animal who ran off to have a great adventure has always been driven to escape his destiny, to overcome his limitations and be more than just a half-blind earth-dweller. 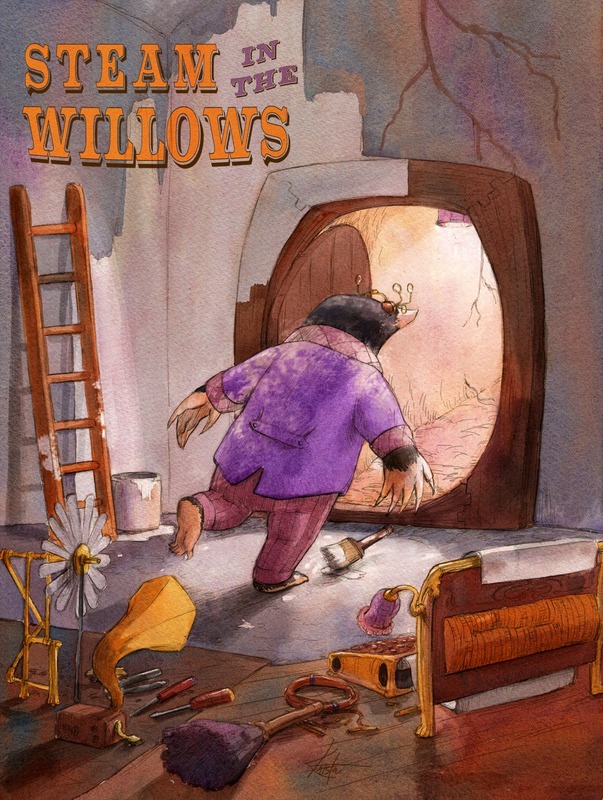 From his custom-built glasses and typing machines, to the gramophones and music boxes that bring the sounds of life above ground into his tiny abode, Mole builds to bring dreams to life.